Eating challenges are something that virtually every family caregiver for a senior who is dealing with Alzheimer’s disease will have to face. 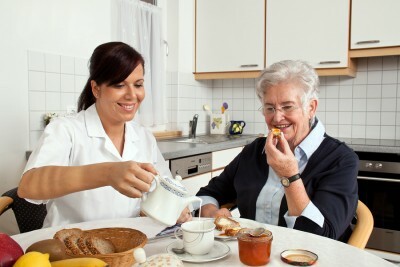 There are many different factors that can contribute to elderly adults coping with this disease having trouble eating. From no longer enjoying the flavors of the foods that they once ate to having trouble recognizing food on their plates and bowls, these challenges can contribute to malnourishment and other issues. A few simple tools and techniques can help you and your parent’s elderly health care services provider address these challenges for improved meal times. Contrasting tableware. Not being able to differentiate between food and a plate or bowl can be frustrating and confusing for a senior with Alzheimer’s disease. Brightly colored tableware stands out from the tablecloth and creates a contrast with the food. The bright colors also stimulate appetite. Specially designed tableware. The tableware you can use with a senior with Alzheimer’s disease is not just about the color. Many companies offer plates, bowls, cups, and even flatware that address the needs of seniors with Alzheimer’s disease. Special bowls feature tilted bottoms so that liquid foods flow to one side for easy scooping. Plates and bowls have raised edges and skid-proof bottoms to keep the dishes from moving across the table when the senior is eating. Cups are designed to avoid tipping and feature straws that do not come out of the lid. Spoons and forks are off-set and feature curved handles to make it easier to hang onto for those who have weaker joints or grip problems. Minimal food options. Offering too many foods at one time can be overwhelming for your parent and he might resist eating because of it. To help prevent this from happening, minimize the number of options that you offer at any given time. You may offer one or two choices eat meal, or offer one or two and then trade them out for another one or two later. It is best if these foods are distinctly different so they are easier to tell apart. Enhanced flavor. For seniors who are dealing with the loss of taste and smell that is common in older age, eating may not be enjoyable. They may either not eat, or they may resort to eating unhealthy snack and convenience foods that contain high levels of fat and sodium that add more flavor. This can have a negative impact on your elderly loved one’s health and wellbeing. Instead of these foods, or adding large amounts of salt, make food more appealing by enhancing the flavor in healthy ways. Vinegars, herbs, and spices boost the flavor of foods without adding fat and calories. This makes the food more flavorful and appealing but does not put your nutritional goals for your aging parent at risk. If you or an aging loved one are considering elderly care in Manalapan, NJ, please contact the caring staff at Lares Home Care 1-800-781-7435 or 732-566-1112.